Wireless Cottage was built in 1908, originally as two homes for the operators of the Post Office wireless station. Later it was adapted to accommodate the telephone exchange, with a home for the local linesman; and then in more recent times it has been progressively adapted and refurbished throughout to provide spacious, comfortable accommodation for ourselves and guests. 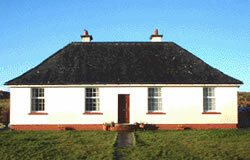 Wireless Cottage is situated just 300 metres from where the Caledonian MacBrayne ferry sails to and from Oban. With tourist office, bank, post office, small shops, pub/hotel, filling station, car hire and other amenities and services, Lochboisdale makes an excellent base for exploring Uist’s sweeping white-sand beaches, wild heather-clad hills and innumerable lochs. The cottage is single-storey, so all rooms are on the ground floor and easily accessible. The house has central heating throughout. The family room sleeps three, with one double bed and one single bed. The other room sleeps two, arranged either as two single beds or a large double, as required. The sitting room is equipped with Sky TV, DVD player, local newspapers, a selection of games, and local information. Breakfast is served in the sitting room from 7am (6am on Mondays) to 9am.